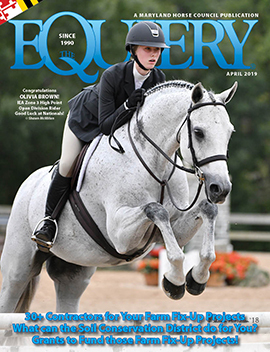 Each year, the Maryland Horse Council recognizes a professional who has had an outstanding and influential career in the Maryland horse industry. This person is typically someone in the industry whose work is widely known but not necessarily widely publicized in the media. The recognition of such individuals is designed to inspire young people to combine their love of horses with their chosen careers. The 2009 honoree is Bob Shirley, a man who has had an outstanding and long career in the Maryland horse industry. Bob has been involved in many aspects of the horse and agriculture industries including farming, announcing at fairs and shows, educating the state’s youth, breeding Clydesdales and foxhunting. Bob Shirley comes from a long pedigree of professional horsemen. His grandfather was Major Joseph W. Shirley, Sr., the commanding officer of the only cavalry troop in the Maryland National Guard. His father, Joseph W. Shirley, Jr., bred Clydesdales and hunted with Carrollton Hounds throughout the 1930s and 1940s. With such strong horsemen in the family, it only seemed natural for Bob to get on a horse at an early age. His earliest memories of horses are during World War II. With the shortage of gasoline throughout the country, Bob’s father would hitch up Black Beauty, a Shetland/Hackney cross pony, and take the kids to Sunday school or wherever the family needed to go. “We did everything with that pony…driving, riding, everything,” said Bob. Bob and his father showed the family’s Clydesdales in Maryland and around the country. “My father is my greatest mentor,” said Bob. 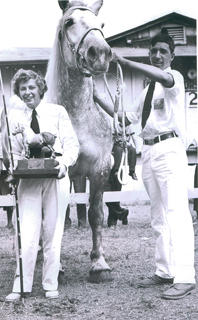 He remembers showing one mare at the 1950 Chicago International Livestock Expo where the mare placed fourth out of 35 entries in the Clydesdale class. “My father was very proud that [that mare] was the highest placed U.S. bred Clydesdale in the competition,” Bob said. Bob also spent much of his youth foxhunting with his father and the Carrollton Hounds. Harry Strauss first established Carrollton Hounds in 1936 and Bob had the pleasure of riding with him. The pack disbanded with Strauss’s death in the late 1960s and then re-emerged in the 1970s. In the 1980s, Bob’s daughter Sally joined Carrollton and Bob shortly thereafter rejoined. Both father and daughter eventually became whippers-in. “Bob never did anything half measure. He could always be counted on to show up for work details, kennel cleaning, trail clearing and helping to organize the hunter paces,” said current MFH and huntsman Dulany Noble. Dulany felt that Bob’s favorite hunting days were junior days, when the junior riders get to ride along side of the whips, huntsman and field masters. “While riding, he would carefully explain every aspect of what was going on so [the kids] would appreciate all the work that goes into chasing foxes,” remembers Dulany. She noted that many of those kids moved on to horse careers or are still enjoying foxhunting as adults. Bob was elected joint master in 2000 and was influential in expanding Carrollton’s hunting territory. He retired as master at the end of the 2008/2009 season and spent some time cub-hunting before the 2009/2010 season began. Bob earned a Bachelors of Science from Cornell University in Animal Husbandry in 1957 and then a Masters of Science from the University of Maryland in Agriculture Education. He found a job which combined both degrees and which would eventually lead to years of service and leadership among the youth of Maryland. He began working for the University of Maryland Cooperative Extension office in 1978 as the Carroll County 4-H agent. “The job was always to be an extension’s officer and work with the 4-H program,” said Bob. But he quickly saw a hole in the program. “No one was in charge of the 4-H programs statewide, so I stepped in unofficially,” explained Bob. Bob had already been working “unofficially” with the 4-Hers of Carroll County since the 1950s as a volunteer and leader. He himself was a Baltimore County 4-Her until he was 21 years old (at the time, kids could join 4-H from ages 10 to 21, now it is 10 to 18). Through combining his official paying position and his unofficial volunteer duties, Bob was able to combine his job as an Extension Officer with his passion for educating the future farmers and horseman of Maryland. One pupil of Bob’s was Andy Cashman, now the Assistant General Manager for the Maryland State Fair. Bob was Andy’s extension officer while Andy was participating in 4-H in Baltimore County nearly 40 years ago. “He is just a great great person. Probably one of the most influential people in 4-H during my lifetime,” Andy explained. Through the Extension office, Bob took charge of organizing the state’s 4-H programs before his retirement in 1998 at the age of 63. He felt his biggest challenge during his career was the changing population in Maryland. “There are less farms and more people who think just because you own a horse and read something in a book or on the internet that you are a horseman. In the old days, you had to earn that title,” he said. Although he no longer works officially with the University of Maryland Cooperative Extension office, Bob is still an active supporter of the Carroll County 4-H program. He still volunteers each year at the championship competitions in Louisville, Kentucky and helps prepare the Maryland 4-H teams. “Our gang always does well,” Bob said proudly. He said their goal is not always to win, but to succeed at some level. Rarely do the Maryland teams come home without each member earning some sort of ribbon or recognition. To any other person, being an active Extension Officer would take up enough of ones day. Not Bob. In his “spare time,” the time when he wasn’t working with 4-Hers, breeding Clydesdales or foxhunting, Bob was able to devote over 63 years to the Maryland State Fair, both in paid and volunteer positions. He was a fair boy himself for many years, showing horses both under saddle and in hand. “We looked forward to fair week. To packing up the horses and spending the week at the fair,” remarked Bob. Bob also met his future wife Margaret (known to all as “Hank”) at the fair. Her family was heavily involved with the Timonium Fair, which eventually became the Maryland State Fair. His first fair job was in 1946 when he was 11 years old. He was an office boy in the Draft Horse office, which at the time was the only type of horse shown at the state fair. From there he held other positions such as reading the dynamometer (measuring wind speed and direction), assisting with the horse pull competition and being a jump mover. Bob is best known, however, for his ringmaster duties, which he began some 30 years ago. “Bob is part of our family. We count on him being here each year and he is. He is a remarkable person who really enjoys being here,” said current Maryland State Fair President and General Manager Max Mosner, Jr.
Bob is not done with the fair yet. He still holds the position of Assistant Superintendent of Horse Shows and plans on announcing every day “as long as they’ll have me,” he said. And since the fair organizational staff considers him family, Bob should remain ringmaster for as long as he likes. If you ask any of the people who have worked with Bob over the years, they will say that he has given more of himself to the community than most in this state. All his life, he has selflessly given to the Maryland horse community his knowledge and skills. Some will say Bob is remembered best as the State Fair announcer, others will say as the 4-H Bowl coach. If you ask Bob though, he will say his greatest accomplishment is the 4-H Therapeutic Riding Program of Carroll County. Bob was one of the founding members in 1978, recognizing a need for a facility and program that would provide an opportunity for children and adults with disabilities to benefit from riding horses. The program started with lessons at a local farm on borrowed horses. It gradually grew in size and “is still alive and well,” said Bob, housed at the Carroll County Agriculture Center where every person involved with the program is a volunteer. Bob and all those involved with the program are proud that for the last 32 years “more than 100 horses and 4,000 volunteers have worked together to provide therapeutic riding classes to more than 2,000 riders.” Bob now has emeritus status with the program. Bob with his son Dan and grandson Joe at the recent dedication of the “Robert Shirley Horse Complex” at the fairgrounds in Timonium. Retirement does not seem to be a word in Bob’s vocabulary. He is still a farmer, a foxhunter, 4-H volunteer and fair and show announcer. He has some new projects, such as the State Farm Museum, for which he is the education committee chair. Bob hopes to head back to Ireland in the near future to foxhunt and visit friends, and would like to travel more around the U.S. as well. He’d also like to visit Scotland, the birthplace of the Clydesdale. As Bob learned from his father and grandfather, his two children have learned from Bob. Or course, both children were very involved with 4-H growing up. Dan was a National 4-H Project winner and is the current Superintendent of Horse Shows for the Maryland State Fair. “I sort of got sucked into the fair,” joked Dan, who was a ringmaster by the time he was 12 years old. Daughter Sally is a well-known event rider who runs her own training business from the family’s Chartley Farm. But Bob’s family is far larger than his children by blood. His 4-H children have also gone on to great accomplishments. Some work for the State Fair, others run their own farms, some are veterinarians and farriers and some have even become extension officers themselves. Without a doubt, Bob’s legacy is not just his own career in the Maryland horse industry, but the horse industry careers of others he nurtured or inspired. As long as Bob keeps teaching, and his students keep teaching, the future of the Maryland horse industry looks pretty bright. When asked what advice Bob could give to the youth of Maryland, he simply said “when you go to do something, you do the best you can. Actions speak louder than words, so go out and show them what you can do.” Bob believes everyone needs to work hard to make his or her program the best that it can be – whether that program is a farm, a horse or 4-H, let the product of the program speak for you. Bob’s product, his life’s work, speaks loud and clear: what an incredible man.